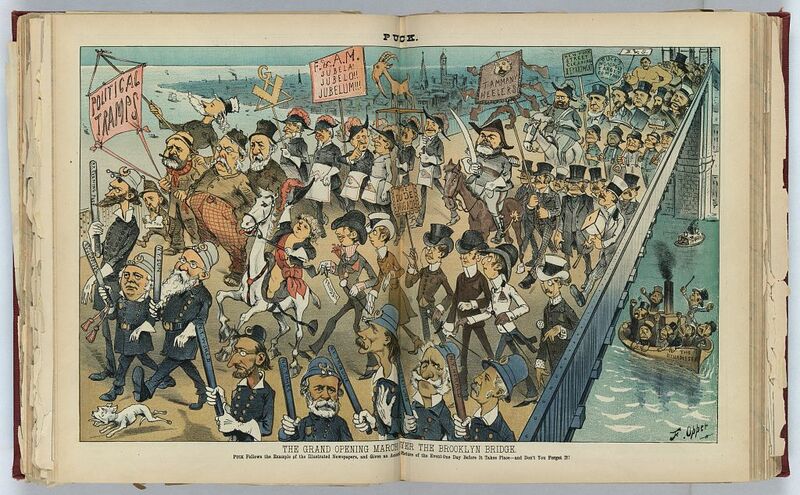 Grand Opening March over the Brooklyn Bridge Image via Library of Congress. Walking over the Brooklyn Bridge on a beautiful day is one of those must-do New York City experiences. Anyone who has made the crossing is familiar with the throngs of tourists that pack that iconic narrow wooden promenade down the center of the bridge. But dodging crowds and speeding cyclists was nothing compared to the peril that unfolded the week the bridge opened 130 years ago. Just six days after opening to the public, a rumor quickly spread that the new bridge was about to collapse. The resulting panic caused such a massive stampede that 12 were killed in the crush. The tragic incident started the afternoon of May 30, 1883 when a woman tripped and fell descending the wooden stairs on the Manhattan side of the bridge. Apparently, this caused another woman to scream at the top of her lungs, which caused those nearby to rush towards the scene. The commotion sparked a chain reaction of confusion, as more and more people panicked and mobbed the narrow staircase, creating a massive pileup. Thousands were on the promenade, quickly turning the situation deadly. Brooklyn Bridge circa 1894. Photo via Library of Congress. At the time, the bridge was the only land connection between New York and Brooklyn, which were then two separate cities. Opening day, the mayors of each city met in the center and locked arms as part of a spectacular celebration. Special trains had brought thousands from Long Island and Philadelphia to see the novel bridge. In the following days, masses of New Yorkers, Brooklynites, and visitors alike flocked to walk across the “New York and Brooklyn Bridge.” In the first day alone, 150,300 people made the crossing.The tragedy highlights the doubt in that era that a bridge could be built big enough to span the East River. With a span of 1,595 feet 6 inches, at the time it was by far the longest bridge in the world, and 50% longer than any suspension bridge ever attempted. The two stone 276-feet-tall towers were the tallest structures in New York, except for Trinity Church’s spire. Twenty-seven workers had died during 14 dangerous years of construction, as well as John Roebling, the designer of the bridge. In the previous decades, dozens of failed suspension and iron bridges had collapsed around Europe and the US, killing hundreds. Since this was the first suspension bridge to use steel cables, it was new, unproven technology. So when a panic broke out on the Brooklyn Bridge in 1883, you can imagine how many were already a little nervous about being suspended 135 feet above the water. Believing a collapse was imminent, terrified pedestrians scrambled for the exit, trampling one another. Panicked men, women and children piled on top of each another and became trapped against the iron fences that line the narrow promenade. In true old-time New York fashion, pickpockets came to rob the helpless victims. Eventually, some quick-thinking workers were able to cut away some of the iron fence, allowing trapped victims to escape from the promenade onto the streetcar tracks below, which are now the two center traffic lanes. Afterwards, The New York Times described a vivid, gruesome scene, littered with gloves, shawls, handkerchiefs, smashed jewelry, crumpled men’s and women’s hats, and shredded trimming from ladies’ dresses. Broken canes and torn parasols spattered with blood were strewn about the roadway. 12 had died on the stairs, and more than 35 were wounded. The following year, P.T. Barnum helped to reassure the pubic of the bridge’s safety (while publicizing his circus) by leading a parade of 21 elephants over the bridge. The stunt is memorialized in the children’s book, 21 Elephants and Still Standing. Anyone who was comforted by this demonstration really shouldn’t have been, since the bridge was overbuilt to be six times stronger than necessary, with a capacity of 18,700 tons, or over 2,500 African elephants. So rest assured next time you cross the Brooklyn Bridge, but please, do be careful on the stairs.